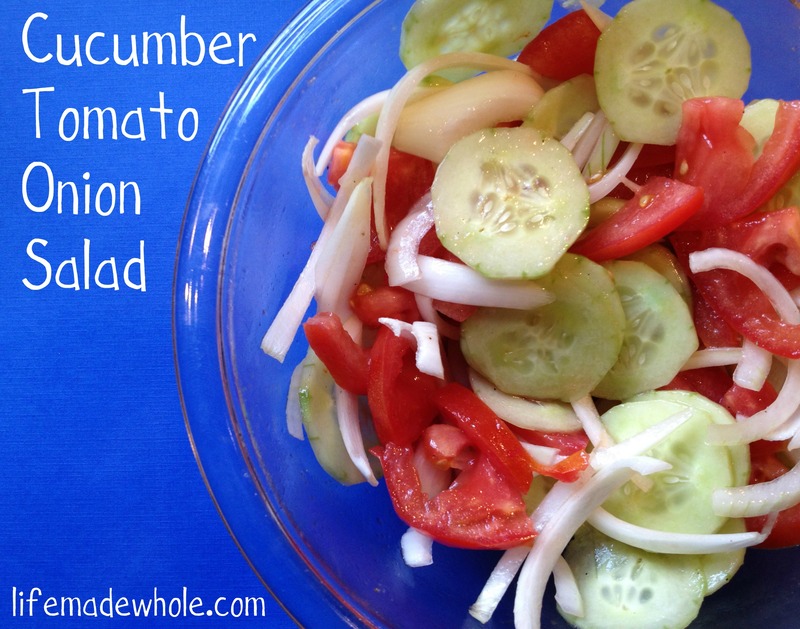 This has to be one of the easiest side salads ever! I love this because it is so simple yet tastes so good. The taste of this is pure summer. I know we are still in spring, technically, but I don’t care. I am making hamburgers for dinner tonight (from local grassfed ground beef) and this side salad is the perfect complement. Did I mention how pretty it is? The ingredients can vary in amounts based on personal preference and the oils / vinegars used can be swapped as well. I have seen people make it with balsamic, apple cider, or just plain white vinegar. I happened to have white balsamic vinegar that I like so I used it. Mix all together in large bowl. Refrigerate for at least one hour before serving to allow flavors to develop. This is a great picnic food as well! You can also switch out the sweet onion for a red onion to add a different dimension of taste. Enjoy! This entry was posted in Food, Gluten-Free, Side Dishes and tagged salad. Bookmark the permalink. I love simple, refreshing salads like this! Looks terrific! We have used this recipe from your Grandmother for years. especially good in the summer with local tomatoes.